Catholics believe that the bread and wine in the communion change into the body and blood (and divinity) of the Lord Jesus Christ. They taught that the bread and wine are no longer bread and wine despite of the fact that it appears bread and wine. Rather, both are now 100% body and blood (and the divinity) of Jesus Christ himself. This change is specifically defined by Catholicism as a change of substance ( i.e. "Transubstantiation"). So, what are the Biblical arguments against Transubstantiation? Matthew 26:26-28 And as they were eating, Jesus took bread, and blessed it, and brake it, and gave it to the disciples, and said, Take, eat; this is my body. And he took the cup, and gave thanks, and gave it to them, saying, Drink ye all of it; For this is my blood of the new testament, which is shed for many for the remission of sins. Jesus changed the bread and wine actually into his own flesh and blood. Jesus was using metaphor to describe his death as the means of life for us. The second possibility gains strength as Jesus used his flesh as a metaphor for life giving sustenance previously. That Jesus was not talking about physical eating was further strengthened by his contrast with the bread Moses provided. John 6:67-68 Then said Jesus unto the twelve, Will ye also go away? John 6:53-54 Then Jesus said unto them, Verily, verily, I say unto you, Except ye eat the flesh of the Son of man, and drink his blood, ye have no life in you. Whoso eateth my flesh, and drinketh my blood, hath eternal life; and I will raise him up at the last day. Here it would seem to bolster the argument for a literal eating and drinking of the body of Christ. However, the statement that if they did not eat and drink they would have “no life” in them shows a different kind of life than what most understood, eternal life. The literal view loses some support as Jesus emphasizes that it is the spirit that gives life. The best support for the metaphor view comes from the practice of communion in Corinth. 1 Corinthians 11:21 For in eating every one taketh before other his own supper: and one is hungry, and another is drunken. Apparently some were getting drunk at communion which would indicate it was not physical blood. 1 Corinthians 11:29 For he that eateth and drinketh unworthily, eateth and drinketh damnation to himself, not discerning the Lord's body. For this cause many are weak and sickly among you, and many sleep. However the best evidence would not be Biblical but forensic. If a sample of blood and wine were examined after transubstantiation, it could easily be proven to be real flesh and blood or not. Now, since the doctrine of transubstantiation specifically provides that after the consecration, the substance of Jesus has replaced the substance of bread, this means that there is no bread after the consecration, despite the fact that it looks like bread, tastes like bread, and reacts like bread in all ways; what there is, is Jesus. But, if Jesus is the living bread come down from heaven, as he himself proclaims, where Jesus is, bread is; and if there is no bread after the consecration, then Jesus can't be there, either: "No bread, no Jesus". On the other hand, the doctrine of the Real Presence as taught by Anglicans and Lutherans provides that at the consecration, the Jesus' body and blood of are found in and with the bread and wine, fulfilling both Jesus proclamation, "This is my body", and the proclamation quoted above, "I am the true bread." 1) The most obvious evidence that Jesus was speaking figuratively about the bread being his flesh, and the wine being the blood of His new covenant, is that while he was holding the bread and the cup, His body -- His flesh and blood -- were physically and literally present in the room, and not as bread and wine. 2) As the ritual of communion is central to the practice of worship, as Catholics and Anglicans maintain, it's odd that communion was not mentioned at all in the gospel of John. Jesus's upper room discourse is, for the most part, in John's gospel, but not the institution of communion. It's odd that such a vital teaching on the worship and practice of the Christian church should be omitted. 3) But while Jesus's institution of a community tradition is not recorded in John, the rest of His upper room discourse is (and while John's gospel doesn't include the communion comments, these comments are surely included in his teaching on the bread and wine from the other gospel accounts), but Jesus declares in John 16:25 that much of his remarks during dinner about his death were figures of speech: "I have said these things to you in figures of speech." Among these things would have been the presentation of the bread and wine as his body and his blood, respectively. In John 16:29, the disciples recognize and concur that much of Jesus's remarks in the upper room were figurative: "His disciples said, 'Ah, now you are speaking plainly and not using figurative speech!" Point: His use of figures of speech would have included His comments about the bread and wine. 4) In viewing communion or Eucharist as the receiving the actual presence of Christ's body and blood, making it the center of the worship service, when it appears clearly that it should be viewed figuratively, is the Catholic/Anglican view of Eucharist missing a key point about the real importance of communion, when they few figurative language as an actual reality behind the tradition? What was Jesus conveying in referring to the bread and wine as his body and blood, in a figurative way? Most of the church may for over 1900 years have missed the true significance of the communion meal by insisting that it is the literal ingesting of Christ's body and blood. 5) Finally, we know that many persons and events of the Old Testament were given as "types" or as foreshadows of the true substance of Messiah, when he came. It may be arguable that Jesus's reference to the bread at the last supper as His body, and as the cup of wine as the blood of His new covenant, were the very last "type" or foreshadow of Messiah's future work -- in this case, future reality being just a few hours away. Until Christ's death, the Old Testament, with its rituals, rules, and Temple worship were still in force. Jesus's words about the breaking of the bread and the cup of wine as His blood fit with other Old Testament era foreshadowings of the work of Christ. A foreshadowing, and not the thing itself....with the substance being Christ Himself. 6) The teaching and practice that Jesus's presence is upon and through the bread and wine at community conveys error, in that each believer who comes to the table to partake in bread and wine already have the presence of Christ in them by virtue of the Holy Spirit, and because of that constant presence in the believer, the believer carries with him or her all the grace Christ wishes to bestow upon believers. Insisting that Christ's presence is upon the bread and wine and can be received by the believe through eating the bread and drinking the wine, is a distortion of the teaching of the true indwelling of the Holy Spirit of Christ in every believer, everyone who walks in faith in Christ's redemptive and sanctifying work on the believer's behalf. In addition to what has been said above concerning metaphorical language, transubstantiation is incorrect biblically simply because it is unnecessary. The sacrifice of Christ and the sacrifice of the Eucharist are one single sacrifice: "The victim is one and the same: the same now offers through the ministry of priests, who then offered himself on the cross; only the manner of offering is different." "In this divine sacrifice which is celebrated in the Mass, the same Christ who offered himself once in a bloody manner on the altar of the cross is contained and is offered in an unbloody manner." The sacrifice of Christ cannot be repeated, whether blood or unbloody. The sacrifice of the Cross, the Scripture says here, was one sacrifice made for sins forever. It does not need to be repeated. Nor do mere men have the power to present Christ to the Father, allegedly in the same way He presented Himself. According to holy text in The Lord's Supper we do not see any indicating to any miracle, so we can not say that a miracle was happened depending on guessing, to say This is my body, maybe can be understood symbolical way like I'm the door, way, You are a salt, This is Lamb of God, Did the Holy Spirit forget to tell us that there is a miracle?! like Cana Wedding when Jesus converted the water to wine. Jesus after he said This is my blood, he called this cup Fruit of the Vine, How Jesus called the cup Fruit of the Vine if he had converted it to his Blood?!!. The new believers from Jewish origins in the First Century will think that it's a Symbolic ideas because this is their thought, because they have the bread and 4 cups in their Jewish Passover, Did any controversy happen between Jews and Christians on this point, no one of disciples writes in letters for Transubstantiation Theology, but we find Paul alone said about the Lord's Supper that we eat the bread and drink the cup, not the body and blood, and if Jesus converted the bread to his body before he broke I ment when he blessed so why the disciples called it breaking bread not breaking body?!. Luke said This Cup is for the new Covenant, but depending on Hebrew 9: 15 the text teached that Jesus is the mediator of the new covenant and death to redeem the First Covenant, so the new covenant was happened when Jesus dead on the Cross which means logically that the cup just a symbol. To understand John 6 look about John 6: 35 and John 6: 63, the first verse is teaching that eating and drinking from Jesus the bread (his body as he told us) by coming and believing, the second verse Jesus ment Spirit concept which is life not the body meaning. There is no changes on the taste, color, smell happens, like Cana wedding. Catholic and Orthodox they have been Sacrificing Jesus by eating the body and drinking the blood of him every week and they believe that it's a real sacrifice, but the Scripture told us that Jesus slaughtered himself a real Sacrifice for all one time and forever. If the Lord's Supper is a real Sacrifice does that mean that Jesus Slaughtered himslef twice times in a few hours the first in the Lord's Supper and the other on the Cross, and if the Lord's Supper is a real Sacrifice what is the benifit of the Cross dying, thats mean Jesus redeemed us in the Lord's Supper. Matthew 24:23-24 “Then if anyone says to you, ‘Look, here is the Christ!’ or ‘There!’ do not believe it. For false christs and false prophets will rise and show great signs and wonders to deceive, if possible, even the elect. 25 See, I have told you beforehand. To me...this shows that when the Catholics say that the bread and wine that they bought has become Christ...and we are to treat it as such...we are not to believe it. Nowhere does the bible teach that communion is the soul and divinity of Christ. Consider this...Jesus is walking along 2000 years ago and he happened to cut himself on a thorn...leaving a piece of his flesh and blood behind. Should we treat that flesh and blood as if Christ were there before us...and fall before it in worship? No...of course not. And why not? Because Christ is the person...not what is left behind on that thorn. We should direct all praise and love and honor towards Him...not towards what other's say is Christ. Communion included. Jesus would not tell us to not believe others when they tell you...here is the Christ...if He was going to dwell body and soul in the bread and wine the Catholics use. The apostle John recorded the first miracle of Jesus Christ which is changing the substance of something into another (e.g. water becoming wine). When the master of the feast tasted the water now become wine, and did not know where it came from (though the servants who had drawn the water knew), the master of the feast called the bridegroom. This is transubstantiation in the literal sense of the word. A change of substance includes a change of form. Catholicism teaches that faith alone should be exercised in accepting the transubstantiation of the communion bread and wine. But this is utterly misleading. The reason is that in Catholicism the bread and wine that underwent transubstantiation is now , beyond any shadow of doubt, really, truly and 100% Jesus Christ himself only in the appearances of bread and wine.So, when someone sees the bread, he could say that He is Jesus Christ but looks like a bread. What we are saying here is that there is no faith at all (biblically speaking). The Synoptics had the record of the Last Supper. The Gospel of John had no record of it. Catholic faith states that what Christ meant was equivalence. "This bread" is equivalent to "my body." "This cup" is " equivalent to "my blood." If Jesus was explaining that the bread is his body itself (in the form of bread),then, the apostle Paul would not call the bread " the bread" if it were no longer a bread after the blessing (cf: 1 Corinthians 10:26; 11:26).This highly implies that transubstantiation of the bread did not occur at the Last Supper. Scrutiny of the words of Jesus shows that Jesus' words were contrary to Catholic interpretation. The reason why is that Catholic faith teaches that the bread is not Jesus' body unless it changed into his substance (i.e. Transubstantiation). After telling His disciples that the cup was his blood...Jesus did still refer to it as "the fruit of the vine" (not "my blood") which highly implies that no change of substance has occurred.The wine was still wine. John 6 portrays two ways of consuming Jesus - figuratively and literally, trusting and believing as well as cannibalism. Therefore, we are of the need to address the texts as hermeneutically sound as possible. Premise 3: Christ said that coming to him results into hunger-free state and believing in Him results into a thirst-free state (John 6:35). Premise 5: The disbelief of the many disciples made them go away but the apostles believe in Jesus (John 6:64,66,69). P1 and P2 are coherent. Both show that Christ wants people to comsume him in a cannibalistic way. Hence, the disgust of the Jews and of his many disciples. P3 shows that P1 and P2 are not meant to be understood as a literal consumption. It shows that consumption of Jesus is the same as coming to Jesus.The cannibalistic language was used to portray his real incarnation (John 6:38). P4 and P5 strongly supports conclusion 2. Those who left Jesus did not want to believe in Him due but those who stayed, as the scripture says, believed in him ( did not literally eat him! ).The reason the apostles alone came to Jesus by faith is that the Father has drawn them to Him (John 6:44). 16 The cup of blessing that we bless, is it not a participation in the blood of Christ? The bread that we break, is it not a participation in the body of Christ? Paul explicitly identified the communion bread as "the bread we break." It is surely a blessed bread but a bread nonetheless. 23 For I received from the Lord what I also delivered to you, that the Lord Jesus on the night when he was betrayed took bread, 24 and when he had given thanks, he broke it, and said, “This is my body which is for you. Do this in remembrance of me.” 25 In the same way also he took the cup, after supper, saying, “This cup is the new covenant in my blood. Do this, as often as you drink it, in remembrance of me.” 26 For as often as you eat this bread and drink the cup, you proclaim the Lord's death until he comes. Paul explicitly identified the communion bread as "bread" in the context of what the Synoptic gospels had. It bolsters the evidence that Transubstantiation of the bread and the wine did not happen at the Last Supper. The New Testament consistently shows us that the communion bread and wine do not undergo change of substance. Rather, both were still what they were (i.e. bread in substance and wine in substance). The Bread of Life discourse in John 6 does talk about Cannibalism but neither Transubstantiation nor the Eucharist meal was mentioned . The words of Jesus Christ himself about the cannibalistic consumption of his flesh is not left without clarification whether to take it literally or figuratively.In the immediate context, Jesus Christ himself spoke of the consumption of Him as equivalent to coming to Him and believing in Him (John 6:35). There is not one Bible verse that speaks of 'transubstantiation' of the communion bread and wine. However, a change of substance was indeed recorded (water becomes wine) in John 2:9.If there were really a change of substance in the Eucharist meal, then,it must have been recorded in the Bible. The absence of explicit and implicit scripture revealed transubstantiation as a theory without biblical substance. You need go no further than our Lord's words in John Chapter 6 to understand why transubstantiation is an impossibility. Some of the answers provided have already mentioned John 6, but no one yet has quoted the most important verses in the chapter—at least those verses touching on the subject at hand. In Roman Catholicism, church tradition trumps the Scriptures. To most Roman Catholics, any argument about the subject of transubstantiation which relies on the Scriptures alone for its proof is bound to fail. Moreover, and stated more baldly, any argument about any Christian doctrine or concept which relies on the Scriptures, only, for its legitimacy is bound to fail and to be unconvincing to Roman Catholics. Furthermore, the same can be said about any and all doctrines about which Catholics and Protestants have argued for centuries. In other words, arguments about transubstantiation (or any other doctrine over which Protestants disagree with Catholics) are moot. For this reason, the two “sides” in this issue are better off looking for common ground in their respective faiths than in trying to win a given argument. Enough said. ”Truly, truly, I say to you, unless you eat the flesh of the Son of Man and drink his blood, you have no life in yourselves” (v.53 NASB). You blockheads! I am not talking literally about my body and blood. No. I'm talking spiritually about the life-giving power of my life and my words. If you truly believed in me you would realize this and not take offense at my hyperbole. Don't you see I am using hyperbole as a winnowing rhetorical device to separate the true believers from the unbelieving sycophants and hangers on? Jesus himself did not believe in transubstantiation, so why should we as his followers believe any differently? Are our Lord's teachings—rightly understood—*less important than any church's teaching? In my opinion as a Protestant, the above reasoning is unassailable. Having said that, however, and by way of conclusion, when Catholics and Protestants debate one another, perhaps there is nothing more important than preserving “the unity of the Spirit in the bond of peace” (Ephesians 4:3 NASB). Finding common ground is perhaps more important than attacking the foundational presuppositions of each other's traditions and teachings. Perhaps agreeing to disagree agreeably is more important than debating a non-debatable doctrine. Not the answer you're looking for? 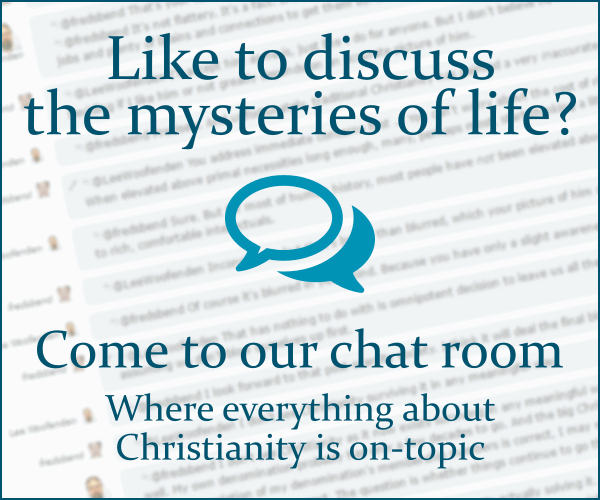 Browse other questions tagged catholicism biblical-basis communion transubstantiation or ask your own question. Why do literalist Protestants reject transubstantiation? How do Catholics support transubstantiation? Does transubstantiation apply to the Last Supper, which occurred prior to the crucifixion? What is the Lutheran doctrine of consubstantiation and how does it differ from transubstantiation and a more general protestant sacramental view?